Sometimes I am super particular about my rice. Ok, no, I am always particular about my rice. Spanish rice must taste like the stuff you get in the Mexican restaurants, for example, and Chinese fried rice must taste like the stuff you get at the Chinese restaurants. I don’t want any of those fake recipes, or “extra” ingredients to spoil the perfection of authenticity. 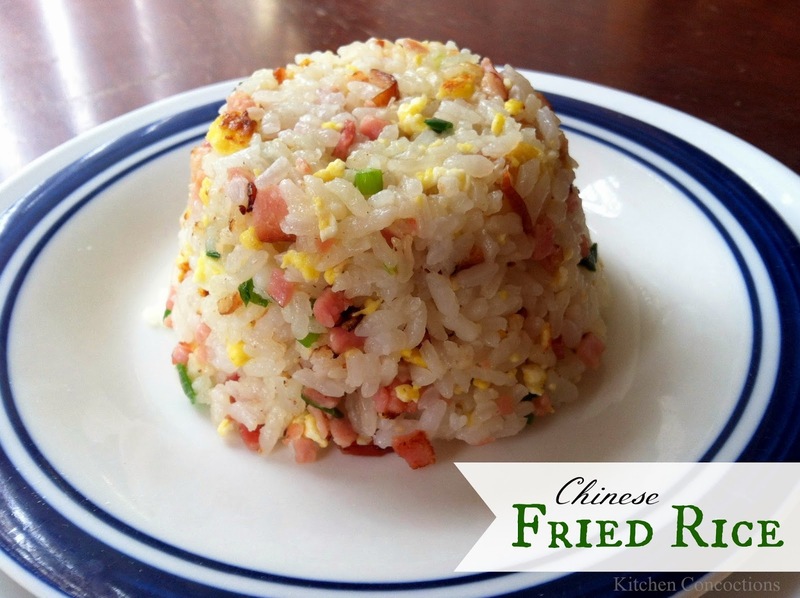 I must tell you, I have been making fried rice for years, and have just barely perfected this Chinese fried rice. All my attempts never quite tasted the way you get it in the restaurants, which bugged me, and Limi didn’t really like them because they didn’t have enough flavor. I figured out the secret though, and this recipe is the perfect result! Limi even requested it for his sack lunch! :) Finally, I can share the recipe with you, and let you in on the secret! Preparation: Wash and hop the green onions, all the way up the stem. Dice the ham in very small pieces. Heat the oil in a large pan or wok, over medium-high heat. Crack the eggs into the pan and stir frequently, breaking the eggs into very small pieces. When cooked but still slightly wet, add the ham, green onions and the bouillon (this is the key ingredient!). Saute, stirring often, until the ham begins to look roasted, with a golden brown edge (about 5 minutes). Add the rice and season with salt. Mix in the rice, very well, and let it fry until everything is hot and sizzling. To serve, lightly spray a cup or bowl with non-stick spray and tightly pack the rice inside. Cover the cup or bowl with the serving dish, and flip over. Tap the top of the cup until you are sure that the rice has come out, and then remove the cup.